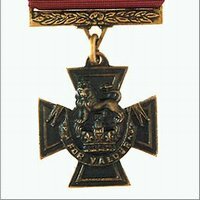 Nottingham Medals buy and sell war medals, war medal groups, individual military and campaign medals, commemorative medallions and all types of badges and patches. Below is a selection of our British World War One single medals and silver wound badges for sale. War Medals, Victory Medals and 1914-15 Stars. All medals and badges are original, in good condition, and waiting to be reunited with others from their groups. Please ask for more pictures or details if required, we will be pleased to oblige. We accept payment by UK cheque, bank transfer, P.O., cash (Euros, US$ or GBP), or overseas payment by PayPal.